An impressive and thorough collection of 160 years (1776 to 1936) of women’s work. This long-awaited volume contains letters, essays, stories, poems and speeches by Unitarian and Universalist women. The reformers and leaders represented here write and speak eloquently for social justice, equality in education, religious reform and an end to slavery and prejudice. Includes a biographical sketch of each woman and informative notes on the texts selected. When challenged concerning this tendency to identify Quaker but not other religious affiliations, one of the compilers of a listing of women in the suffrage movement at the National Women's History Project responded that Quaker is considered a historic identification, whereas Unitarian Universalists are today known as radicals, perhaps causing the connection with historical women to be misunderstood. The two denominations also are frequently confused, so that Universalist women are sometimes identified as Unitarian, the better known of the two traditions. 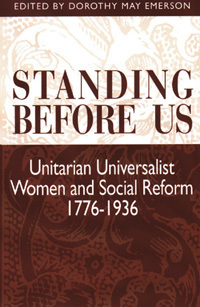 It is time to set the record straight: to identify these women with Unitarianism and Universalism, to begin to explore the influence of their beliefs on their work for reform, and to acknowledge that these two liberal religious traditions contributed many women to the reform movements, despite their relatively small numbers in relation to the general population. The fact that Universalist and Unitarian women were among the first and most consistent to work for women's rights and for reform in a variety of fields is something historians can agree on. This anthology is intended as a beginning step in the exploration of why this is so. Unitarian Universalists today continue to be known for their activism in working for social justice. These historical women and their writings provide a link between the present and the past while locating the origins of social reform within liberal religion. In some cases, these women and their writings are well known; some were widely circulated at the time and had a strong influence on the reforms they advocated. Other writings were and remain less well known, perhaps only influencing a small circle or revealing a voice that was nearly silenced. All reflect an emerging awareness of the need for change. Whether it is a communication among a network of friends or a speech from a famous platform, these words represent an unbroken tradition that deserves to be recognized today as a link with the real historical past. Each writer articulated her vision of life as it should be and called to her constituency and beyond to re-form the world to guarantee justice and promote peace for all.